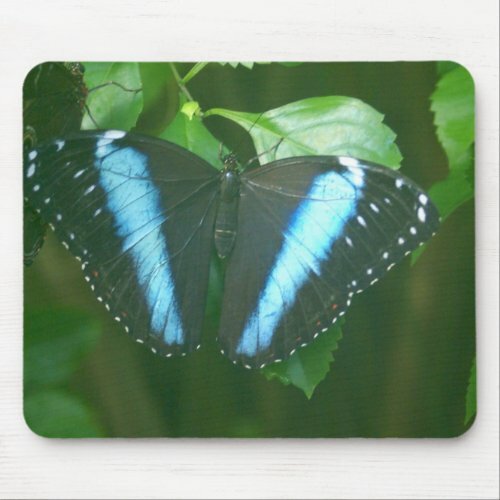 The beautiful blue color of the butterfly does not come fom pigments. 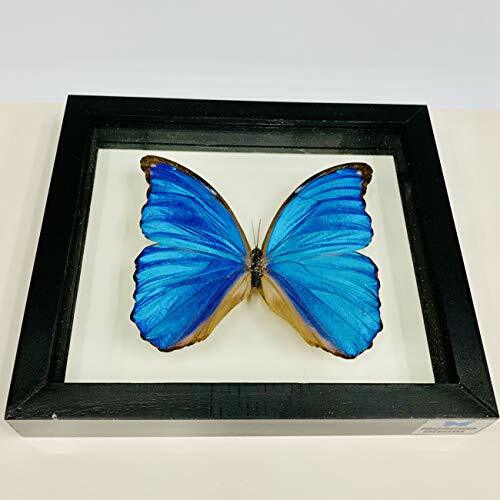 It comes from the light that hits the ridges off the scales and what results is the beautful irridescent blue color that is so stunning on the blue morpho. I volunteer at The Butterfly House in Chesterfield, MO. 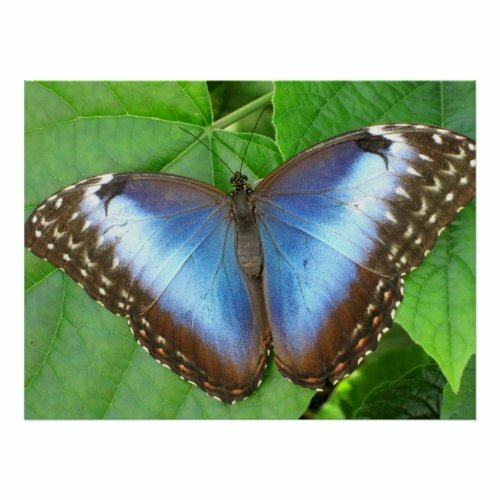 There are two types of morpho butterflies found there, the blue morpho pictured below and the achilles morpho. Each March The Butterfly House hosts a Morpho Mania where they release an extra 3000 morpho butterflies. The effect is stunning with these beautiful morphos fluttering throughout the conservatory. 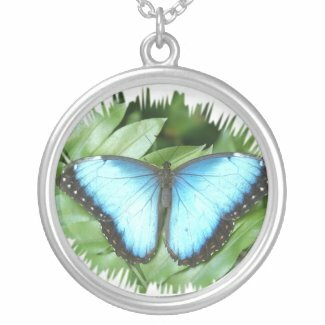 There are over 80 different species of morpho butterflies and not all are blue. Here are some of the characteristics that they do have in common. Butterflies are very particular where they lay their eggs and different species pick different host plants. 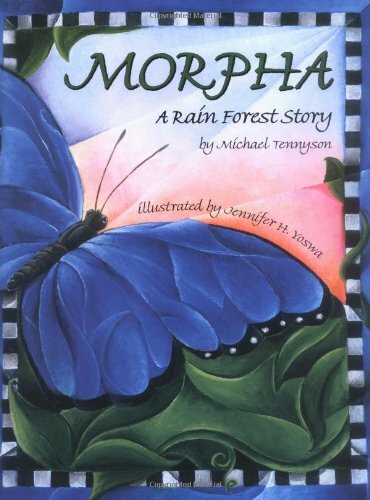 The morpho butterflies lay their eggs on plants in the lugume and mimosa families. Morpho caterpillars are very hairy and have a nice pattern to them. When the caterpillar spins a chrysalis it dangles from a branch and it looks very much like it could be a fruit or a seed. When the adult butterfly emerges from the crysalis it expands its wings and then after several hours it can fly. The photograph below shows the Achilles Morpho. This butterfly was photographed at The Butterfly House where I volunteer. This butterfly came from a butterfly farm in Suriname. I recently saw one of these butterflies in a jar on a shelf at a friends house. The butterflies flutter around in the jar and they look like they are real. I found it fascinating to watch the fluttering butterfly. I think one of these jars would make a fun gift for someone who enjoys butterflies. They come in a variety of different species. The morpho butterflies are from the largest family of butterflies, Nymphalidae. Other butterflies in this same family include the owl butterflies, the red lacewing and all of the Heliconids. The morpho butterflies are native to the new world tropics. They live mostly at ground level in the rain forests. Since the rain forest canopy block light there is no flower growth found and the morphs feed exclusively on tree sap and fallen fruit. At The Butterfly House we will find them feeding on trays of bananas, mellon and other very ripe fruits. This is a beautiful butterfly and has striking underwing markings. I have never heard of the Morpho Butterfly before, thanks for educating me! 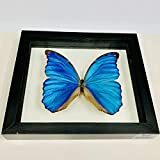 The Blue Morpho butterfly is beautiful! I cannot imagine seeing 3000 of them fluttering around the conservatory. What a stunning site that must be! Fascinating that the blue morpho butterfly color does not come from pigment but from reflection. Beautiful butterfly! We visited a Butterfly House near Branson MO, several years ago. I wonder if it was yours. Butterflies are amazing to watch! 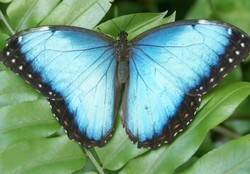 I have seen the blue morpho at a Butterfly house in Massachusetts. Thanks for sharing your beautiful photos! Beautiful pictures and I like how you use them for the gifts.